(Reviewed January 10th 2009) I have already shared memories from restaurant Valuta, located in Kunstbanken, Hamar Art Centre in the middle of the city. A very cold day in January I invited to fusion lunch, and I am happy to say that it met my expectation. Restaurant Valuta has brought an interesting part of the world to Hamar. Hamar is a relatively new city with an architecturally heterogenous city centre. 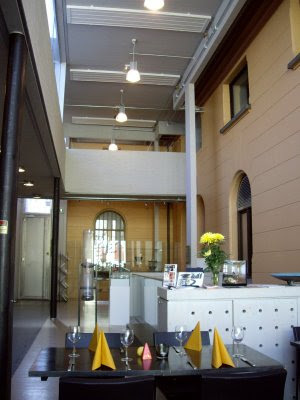 Restaurant Valuta is located in an old bank building, just a five minute walk from Hamar railway station. Close to any public transportation the city has to offer. Charming and scenic? Not really. We arrived at noon when the restaurant opened, and there were only two other guests. The waitress was kind and welcoming. The communication between us and her was quite business like and it did not take us long to order. I ordered a Tom Yum soup with noodles, mushrooms and scampi, and a bottle of mineral water. The restaurant is located in what once was the local affiliate of the Norwegian National Bank, a classic greco-roman style building. Where cashiers once counted the riches of the state, you now find Kunstbanken, a large art gallery. A new addition has been connected to the old building - metal, glass and concrete creates an interesting contrast to the old classic building. I would rate Valuta as a restaurant with a designer interior. Dark / black handcrafted tables and chairs, no table cloth, wine glass, fork and knife and an orange paper napkin. A little bare maybe, but tasteful. There are a generous amount of space around the tables, and you are well seated. 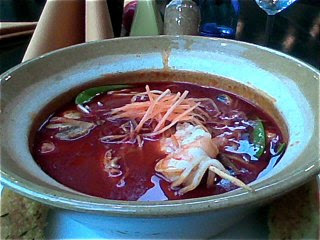 The Tom Yum soup was served in less than 25 minutes, peeping hot, in a rustic ceramic bowl. Delicate green grey colour topped with a thin layer of fresh red oil on the surface. The soup felt more like a broth than a soup. Good consistency of ingredients. Shredded crunchy carrots, succulent mushrooms, noodles and scampi slightly al dente. Medium hot, well balanced. Sweet, sour and salt - and interesting distinct background aroma (coriander?). The seasoning enhanced the taste of the ingredients. Price NOK 139 (Around 15 Euros), but quality assures Restaurant Valuta a full score. A good, borderline recommendable restaurant with a classy, but a little cold designer interior. Some room for improvement of service. Great food makes a visit to Restaurant Valuta worthwhile.